For a while there it appeared grunge lords Mudhoney had slipped under the radar, having been swept under by the wave of Seattle bands they inspired. Remember the Alice in Chains song 'Right turn'? Maybe that was why. 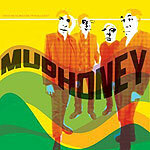 Anyway, Mudhoney are back, if indeed they ever went away, and the world could not be more ready for their return. Dirty garage rock and faded jeans are back in and this new album finds the band wallowing in the filth; flinging grubby sounds around like a college food fight. Steve Turner has never coaxed finer belches of sound from his guitar and Mark Arm has never seemed more in need of Halls Soothers(TM) to calm his ragged tonsils. Mudhoney obviously feel that now is their time, a mindset borne out in particular by the song 'Our time is now'. 'Dyin' for it' and 'The Straight life' are also suitably green coughs of sonic phlegm. The only fly in the already greasy ointment is the fact that there are so many bands currently exploring this particular sewer of sounds - The Vines, The Hives, Von Bondies and the rest are all set up by the trashcan fire under the bridge. The good news is that what Mudhoney lack in youth they more than make up for in experience and focus. This is about as close to the Stooges any individualistic band can get while maintaining their slimy independence. Truly an album of blood, sweat and other bodily fluids, Mudhoney have pulled one foamingly crazed rabbit from the hat, fried it up in lard and served it with dirt. As they themselves say, 'Take it like a man'.